These Sardinian delights are one of the many things I relish tucking into whenever we visit family in Sardinia. As they’re impossible to get over here, I almost get withdrawal symptoms, so I decided to take the plunge and make some myself. I looked for recipes online and, as they’re such an artisanal product, it was difficult to find an actual recipe, but at least it gave me the basic idea of what ingredients I needed to include. I’ve then played with the quantities until I (and hubby) was satisfied that the flavour was as close as we could get it to the ones we have eaten in Sardinia. The unique flavour of these sausages comes from aniseed (though fennel seeds are used interchangeably, depending on who is making the sausages). I found it quite tricky to find aniseed (which surprised me! ), so I made these with fennel seeds. 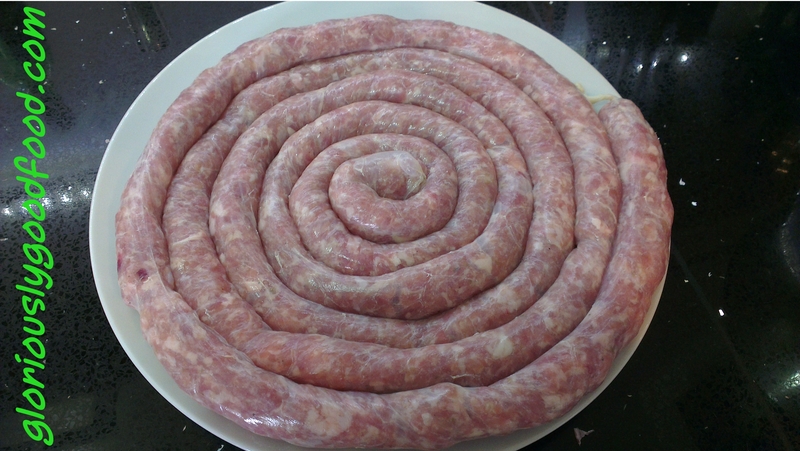 In Sardinia, you would buy S’Artizzu (sardinian sausage) in huge rings to cook over a barbecue, then chop it up once cooked into smaller pieces to to serve on a big platter for everyone to help themselves. The quantities indicated below would make approximately 2 such giant rings, or 12-16 smaller individual portion rings (depending on the size of the rings). 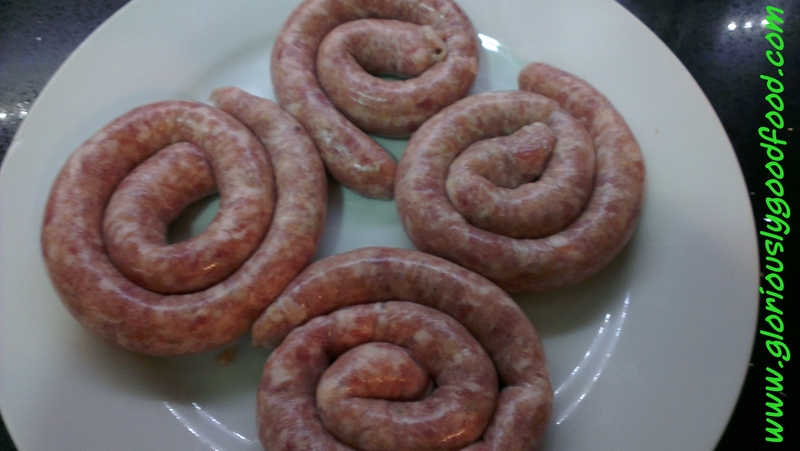 Hubby and I used natural sausage casings we bought from a lovely butcher at Doncaster market, though it was really hard work to thread these onto the nozzle on the sausage-making kit on our mixer. Next time, we’ll try using natural casings bought on a spool. I’ve found a site that sells them HERE. Ask your butcher to take the rind off the pork but leave as much of the fat on as possible, then chop the meat into chunks you can feed through your mincer (grinder). Now the fun begins!! Feed the mixture into your sausage-maker loaded with a long length of thin natural casing and gently fill the casing. Ideally, you want to make one long continuous length you can roll into a big ring (about the size of a dinner plate). Before cooking, put 2 wooden/bamboo kebab sticks through the ring to form a cross, so that the ring will hold its shape on the barbecue. Or, you can make smaller rings like we did, or even thin straight chippolatas (which, due to the casings breaking on us a LOT when we made these, we also ended up doing). Grill, pan-fry, griddle or barbecue your sausages. Freeze those you don’t need to use straight away. 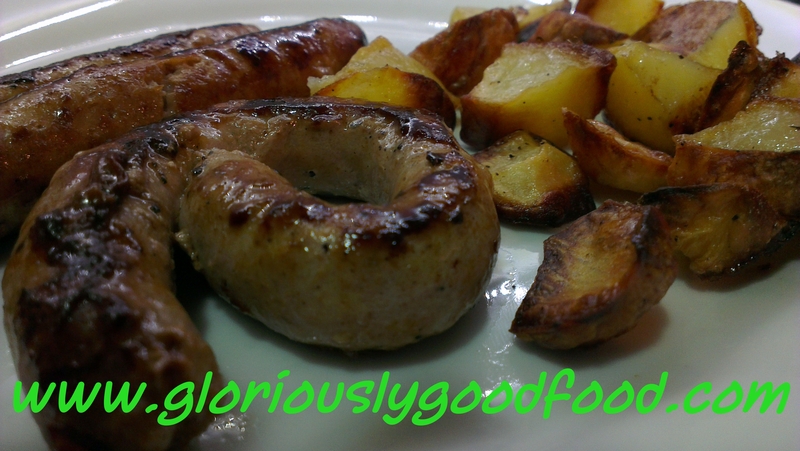 This entry was posted in Italian, Meat & Poultry, Pork, Sausages and tagged aniseed, fennel seed, fresh sausage, garlic, italian food, italian sausage, pork, pork sausage, s'artizzu, sardinian food, sardinian sausage, sausage. Bookmark the permalink. What a great read, i thoroughly enjoyed this. Do you mind if i put a link on my website to this page, so fellow readers can make use of this too? Keep up the good work!